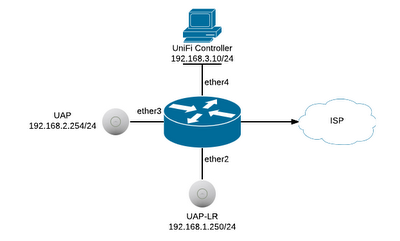 This scenario will explain how to managed UniFi Access Points across multiple subnets with only one UniFi Controller. As of writing there is currently an issue with adopting UniFi Access Points across multiple subnets. 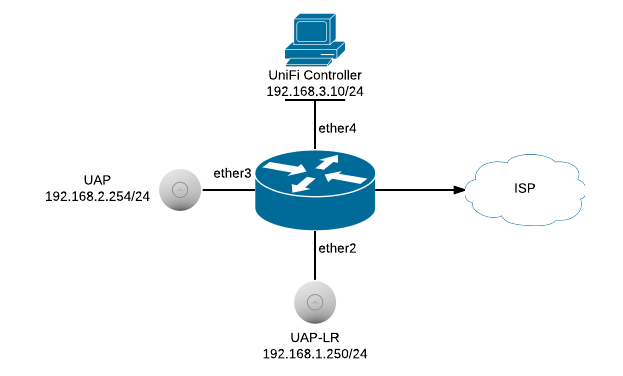 As a result we have adopted our UniFi Access Points with the Controller above on the same layer2 subnet before relocating the Access Points to different subnets. Note: The Value is divided into 3 (01=suboption), (04=length of payload - this must be 4), (C0A8030A=192.168.3.10 - Controller IP Address converted to HEX). You can now relocate your UniFi Access Points to there destined subnets. They should now connect to the controller and are now ready for Layer3 management. 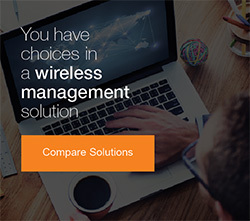 For more information please visit the Ubiquiti UniFi FAQ page here. If you type the following command "/ip dhcp-server network print" you will notice each network/setting has an id starting at 0. in this case we have 3 networks the first with an id of 0, the second and id of 1 and the third with an id of 2. this makes it easy to apply a change to multiple settings at ones (in our case adding dhcp-option=unifi to these 3 networks with one command). I hope that makes sense! Can make life even easier, just been bringing all my UniFi's into a single controller too... Here's one from my own FAQ. Then run again to lock it in. this will hold the Controller IP. Maybe this video will give you full explanation.